There’s a ton of information and helpful tips available on how to protect children during divorce, but here’s a question for divorcing parents: Do you ever think about what your children learn from watching you go through your divorce? Author and blogger Michela Montgomery addressed this issue with an article in Huff Post titled “Three Things We Can Teach Our Daughters in Divorce”. Her second point is that you are not defined by your husband or partner, and that you can stand on your own merits and accomplishments, whether married, divorced or single. Michela’s third point is one that many self-help gurus and spiritual teachers also promote: the importance of living in the present. She explains that dealing with the hurt and pain you are feeling while it’s happening is much more effective than avoiding it. 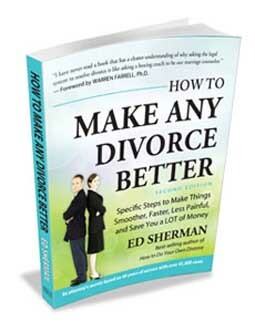 To learn more about Sherman’s award-winning book, visit How to Make Any Divorce Better. To read Michela’s entire article, go to Huff Post.